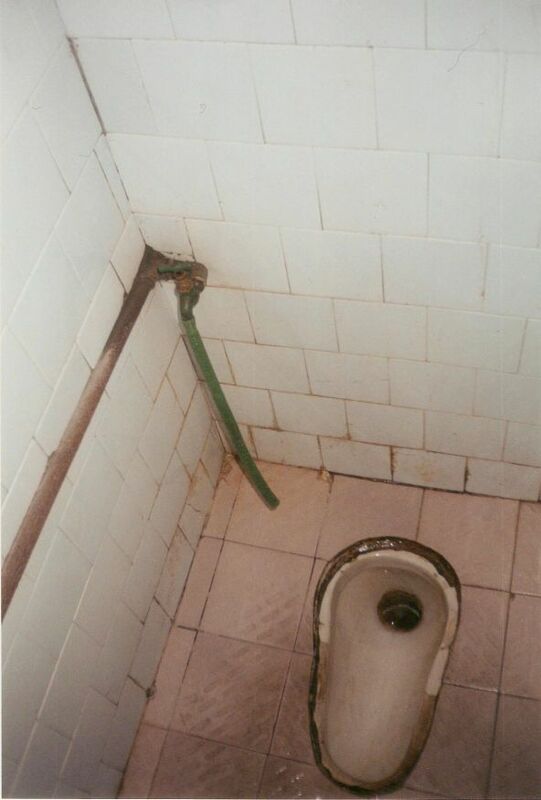 What are Chinese toilets like? They tend to be rather basic, utilitarian and functional but not works of beauty. 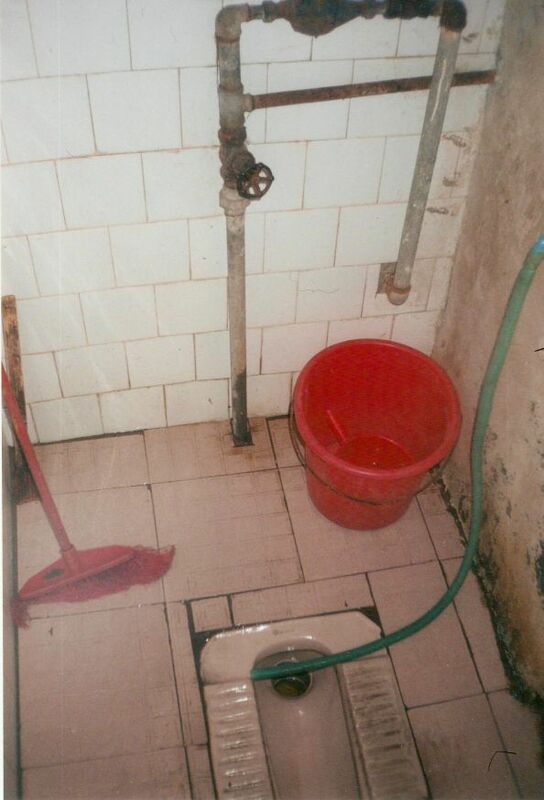 Just the sort of plumbing needed in a Workers' Paradise. 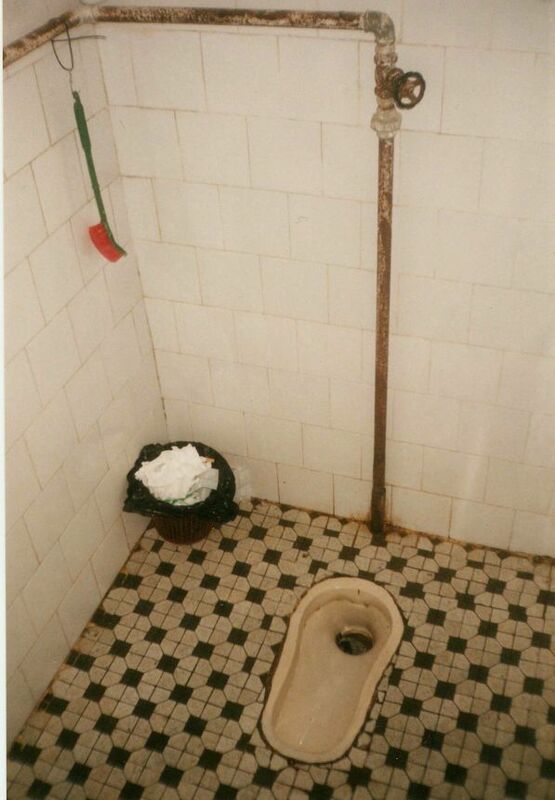 Most are squat toilets, unless you stick to high-end hotels and restaurants catering to American and European visitors. 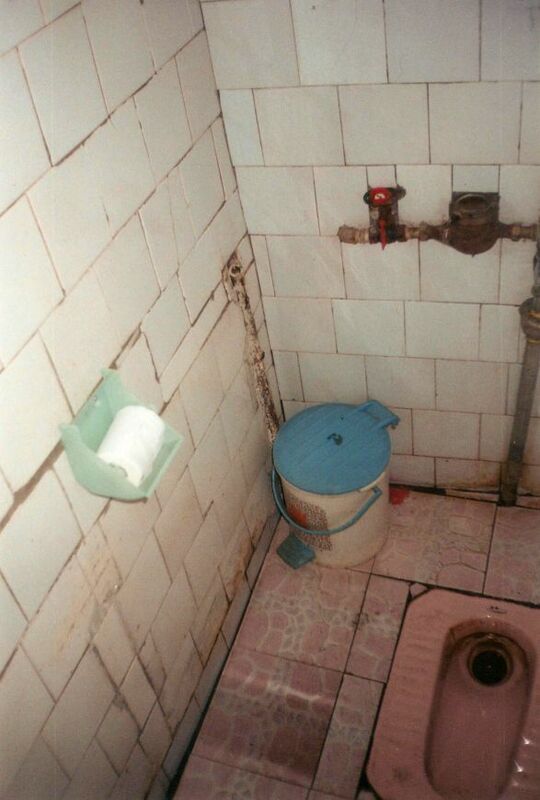 That means that most Chinese toilets can be very clean, as long as their users are reasonablycareful. I expect this to change, as the country becomes less of an idealized Marxist classless society. With the rise of an middle class and greatly increasing affluence, at least in some of the coastal cities, Chinese citizens are traveling widely and otherwise becoming familiar with how the rest of the world lives. That includes the plumbing. 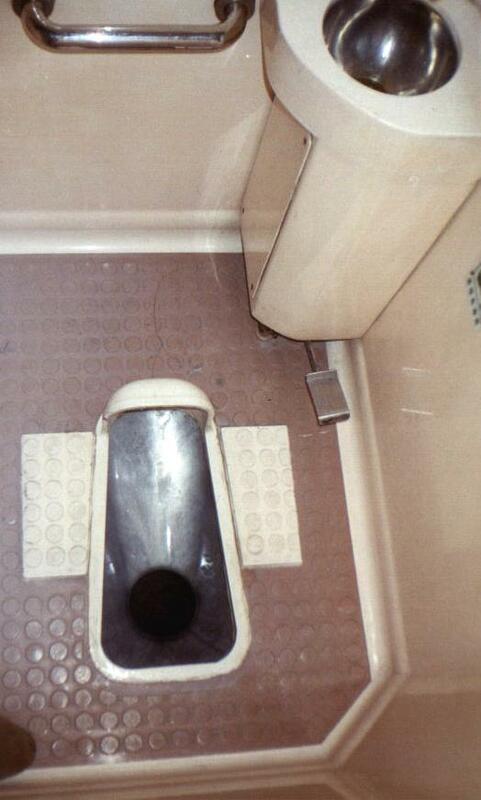 Many more affluent Chinese citizens are visiting Japan, where you encounter the world's most luxurious toilets. 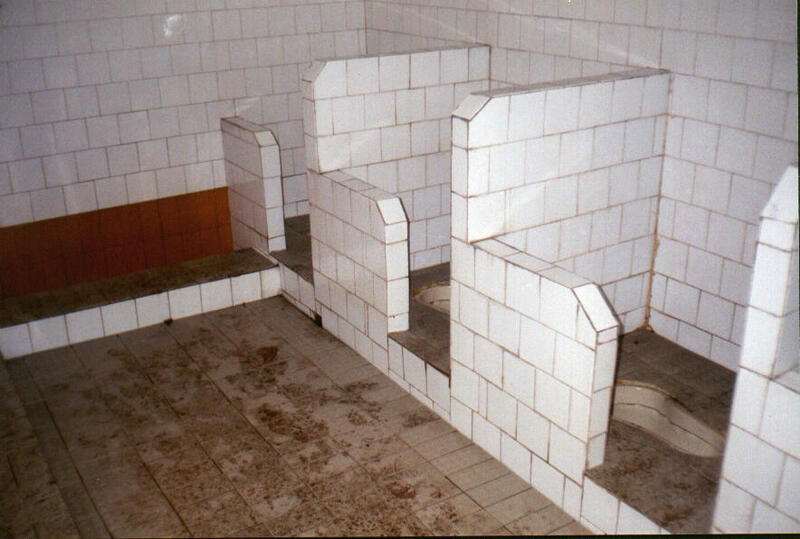 I would expect China to add raised porcelain commode along with the Japanese-style seats with heating, water washing jets, and air-drying. 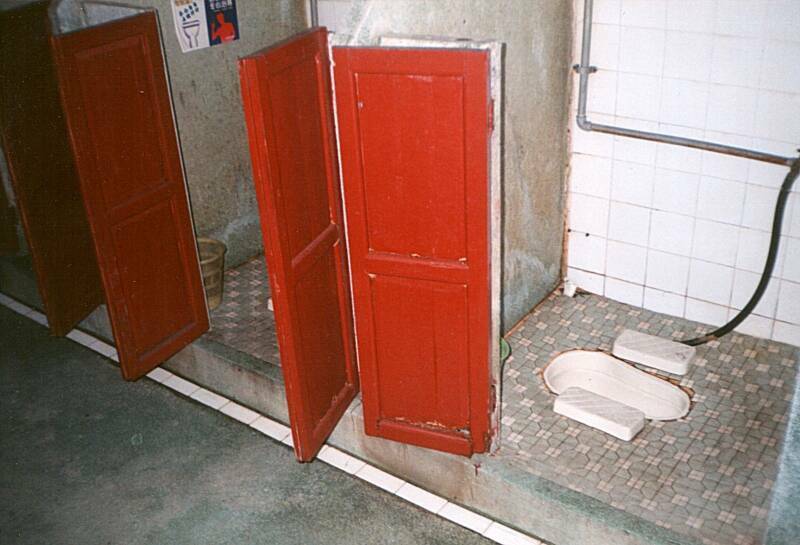 There are still a lot of very basic toilets in China, even in coastal cities like Guangzhou. Some have unusual names. 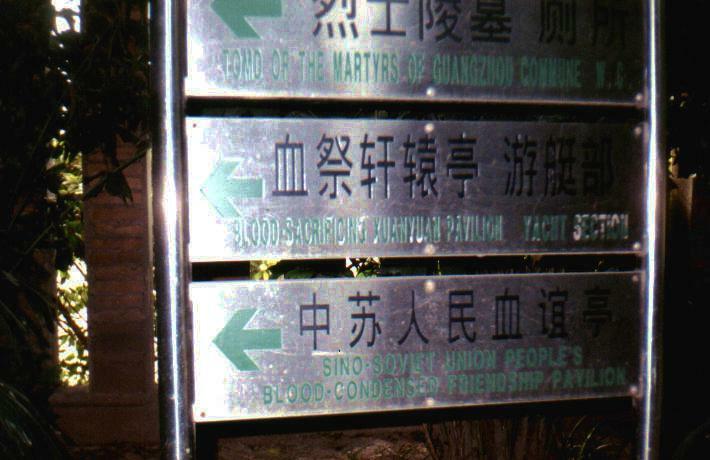 As you can see from this sign, the Memorial to the Martyrs park in Guangzhou has a toilet named the "Tomd of the Martyrs of Guangzhou Commune W.C." Presumably they meant "tomb". The W.C. is just to the left, along with the Blood-Sacrificing Xuanyuan Pavilion Yacht Section and the Sino Soviet Union People's Blood-Condensed Friendship Pavilion. Once inside, as one should expect, the Tomb of the Martyrs of the Guangzhou Commune W.C. is highly communal. Collectivism, not privacy. As this is a men's facility, it has separate areas for functions #1 and #2. 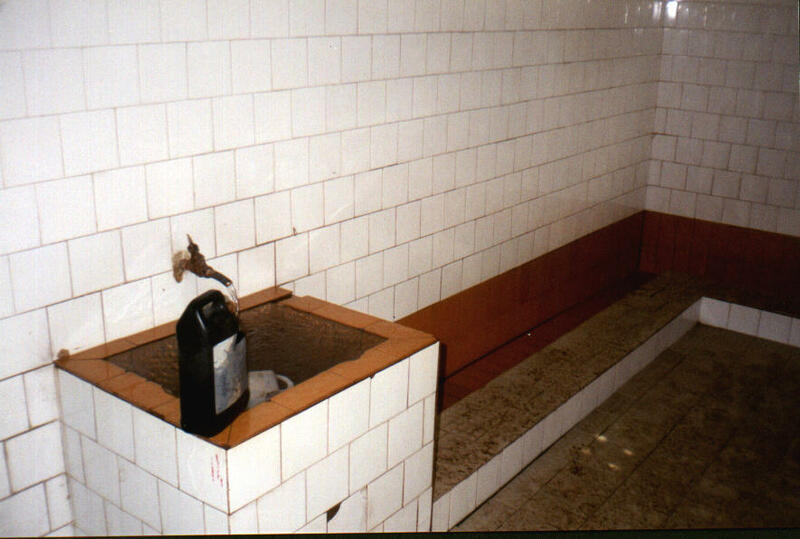 Do #2 in these tile-lined squatting booths, and #1 against the wall seen below. 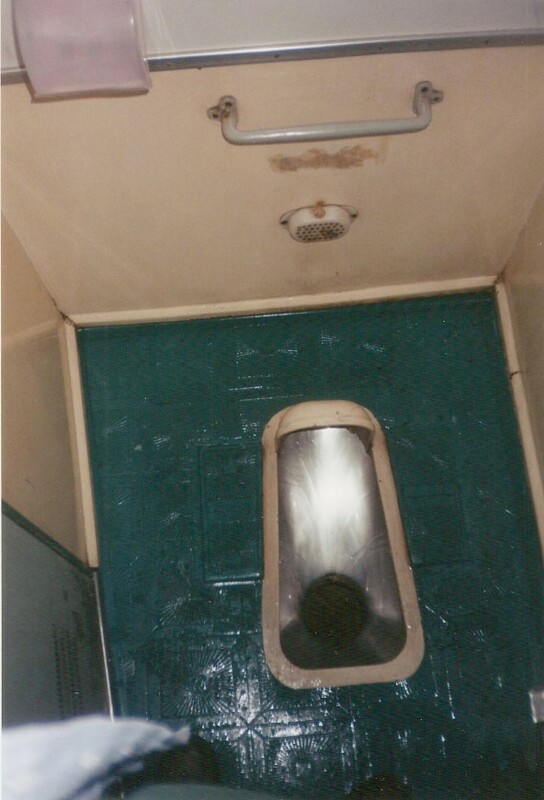 The water flows from the large open tank, where it can be used for washing your hands, through the open trough, and then under the porcelain floor-mounted squatting units. The Temple of the Six Banyan Trees, is one of the few Buddhist temples left standing in Guangzhou. These Chinese train toilets are surprisingly non-nasty, but they are from elite trains frequented by decadent Capitalist Roaders. The first one is from the express train linking Hong Kong and Guangzhou. The similarly designed second one (minus the theoretically non-slip foot pads) is from an overnight sleeper from Guangzhou to Guilin. This is in the "soft sleeper" car. Note the handy two-handed handle, necessary for use when traversing those irregular tracks! 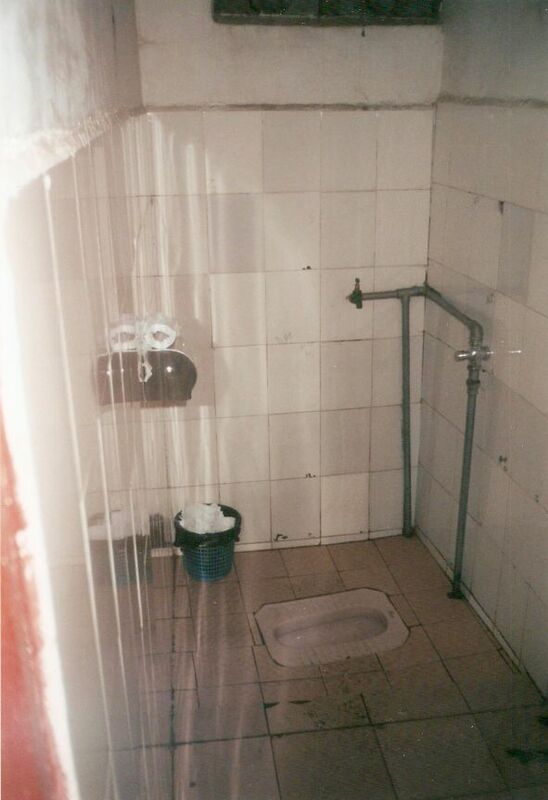 This is one of my most disappointing toilet images — I really wish this one had turned out better. You'll have to make do with my transcription of this sign listing the "Latrine Regulations" from the toilet at the park along the Pearl River on Shamian Island, in Guangzhou. I was so taken with this sign that I copied it down, word-for-word. Click here or on the image for a the transcription. Beware the non-clinical terminology that may be blocked by content filters. 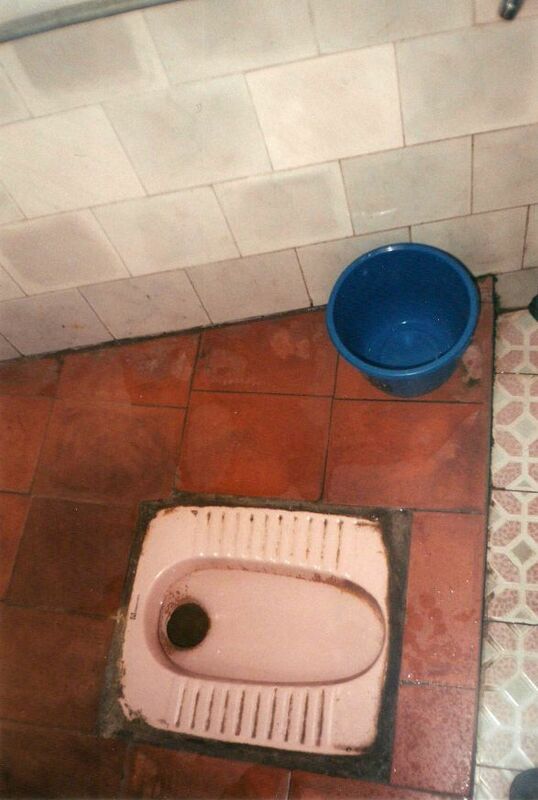 The rest of these are toilets found around Guilin, Yangshuo, and Xingping, in Guangxi Province, in south-eastern China. These are very nice and highly westernized (that is, non-communal) toilets, as far as Chinese toilets go. Most are from bars in Yangshuo. 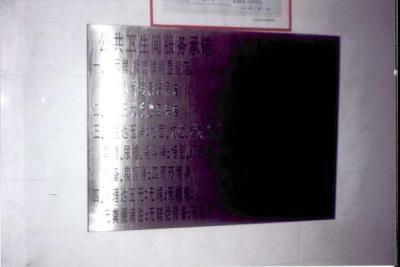 Compare these to those found in the Tomb of the Martyrs of the Guangzhou Commune W.C., above. 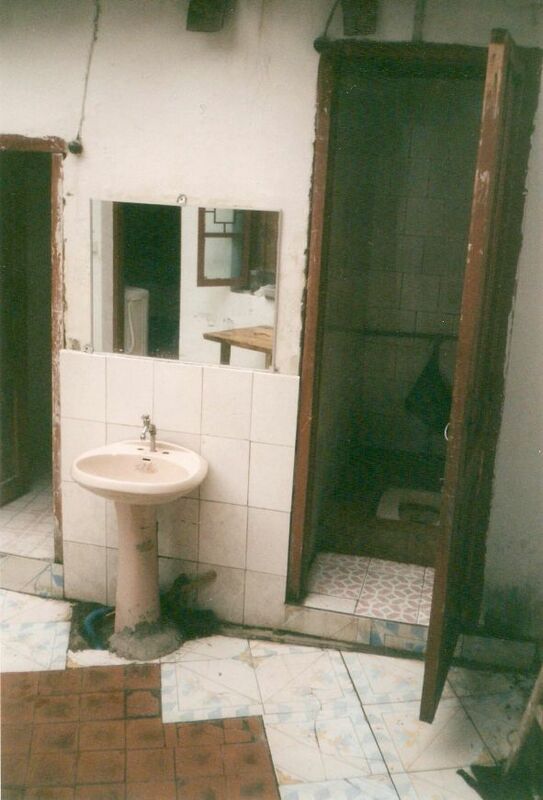 If you are keenly interested in Communist Toilets, then be sure to also see Leon Trotsky's toilets at his nice home in Mexico City. "When we are victorious on a world scale, I think we shall use gold for the purpose of building public lavatories in the streets of some of the largest cities in the world."